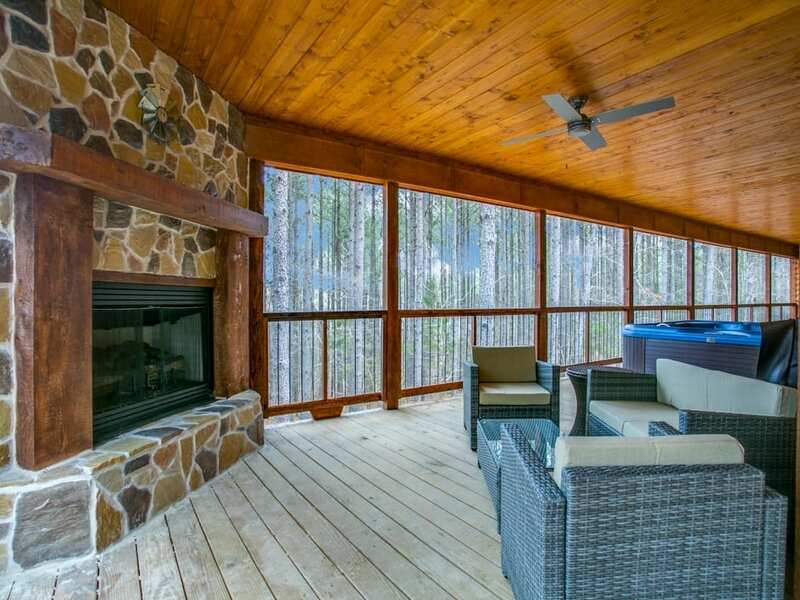 Walk up the stairs of the front porch to find welcoming rockers where you can enjoy the sights and sounds of the surrounding pine National Forest. 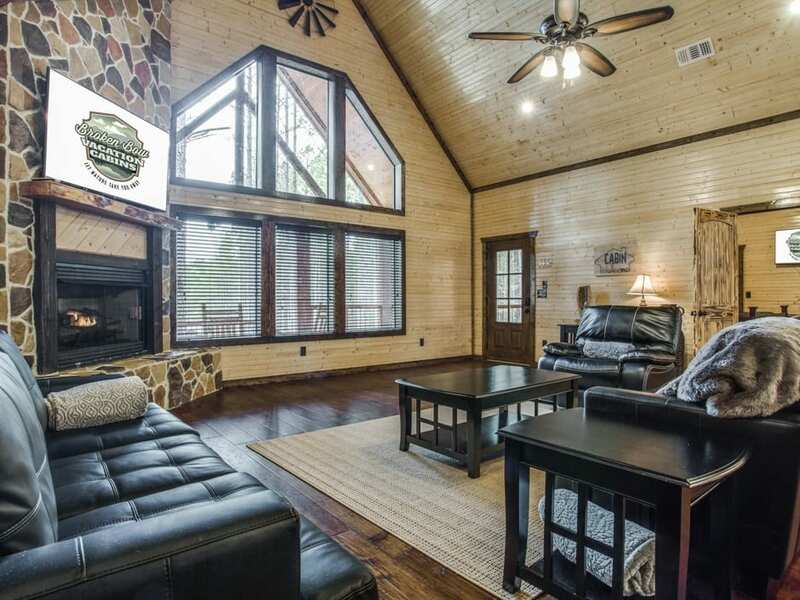 Then enter the living area which has a stone façade gas-burning fireplace and plenty of seating for the entire group with a sofa queen sleeper and love seat that converts to a twin sleeper. Mounted above the hearth is a 55” HDTV with Direct TV package (PPV not available). 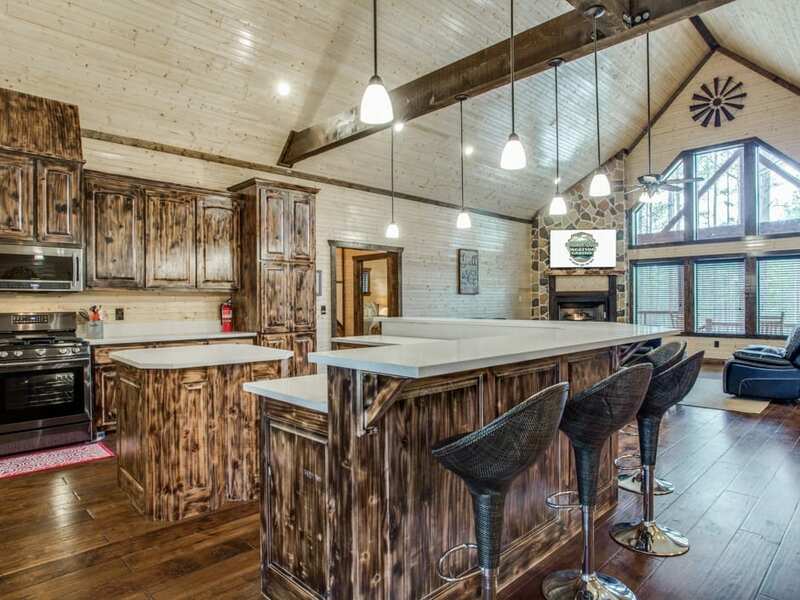 The kitchen area is connected to the living area by an L-shaped bar countertop with stool seating where everyone can gather for conversation while meals are being prepared. 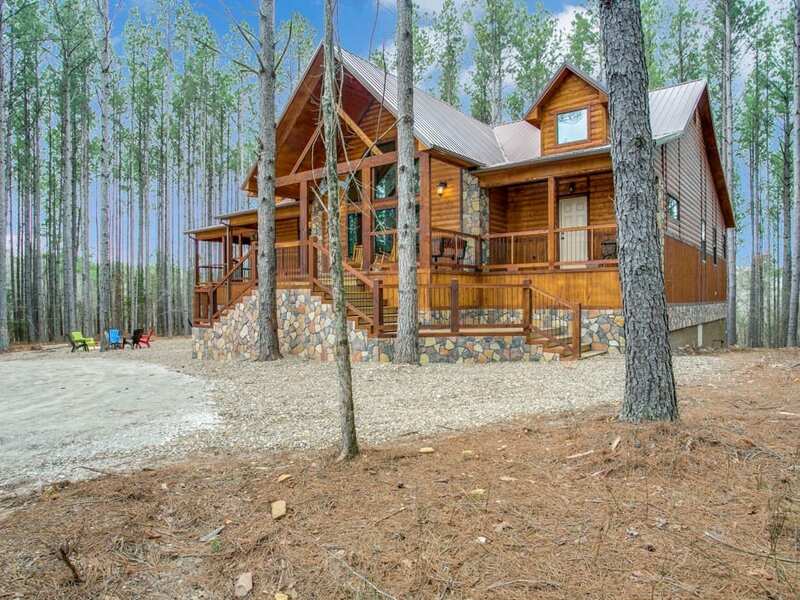 The kitchen is equipped with gas range and oven, side-by-side refrigerator, microwave and dishwasher. The cabinets are stocked with pots, pans, dishes and utensils for meal preparation. 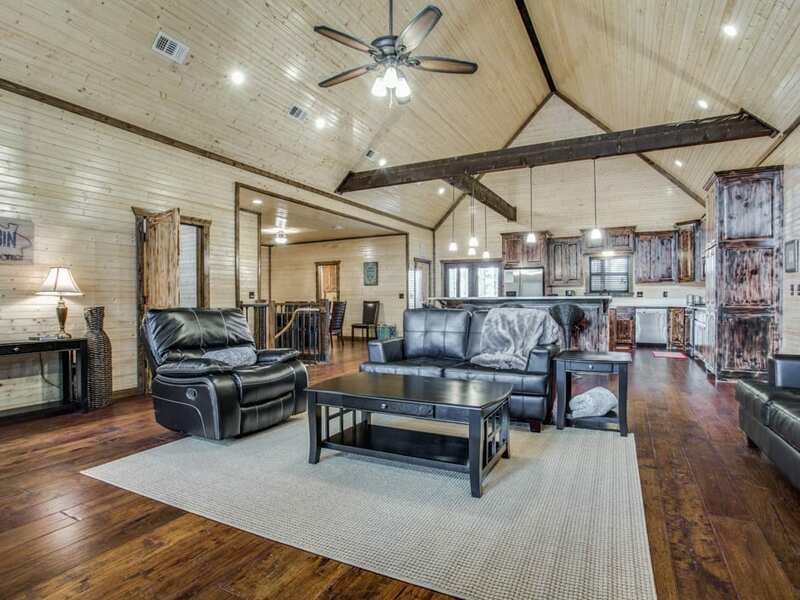 Off the kitchen is the dining table with seating for eight. 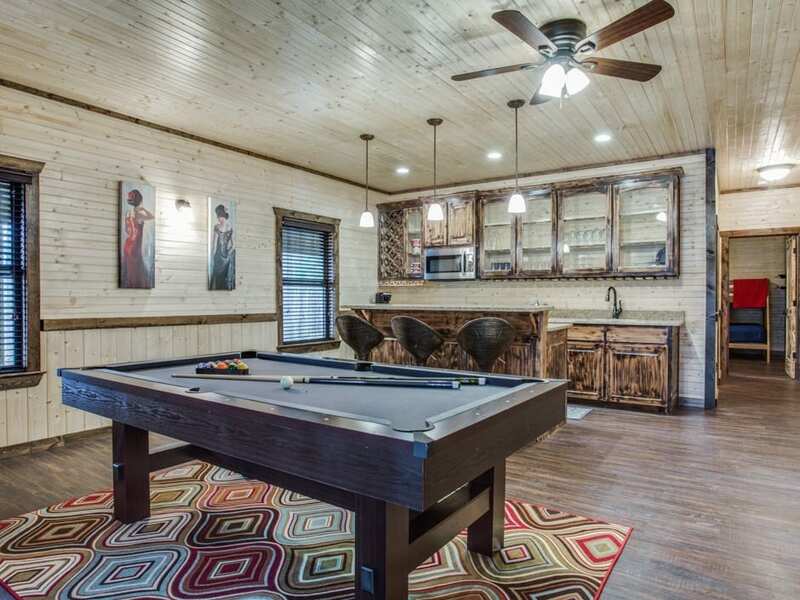 There is a laundry area with double washer and dryer for your convenience and a full bathroom off the dining area. 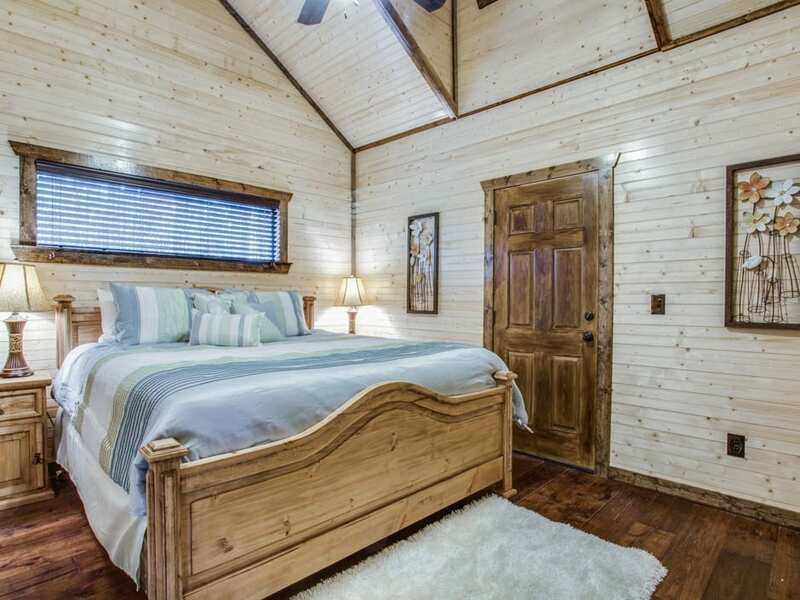 On the upstairs floor are four of the bedrooms each with a private bathroom. 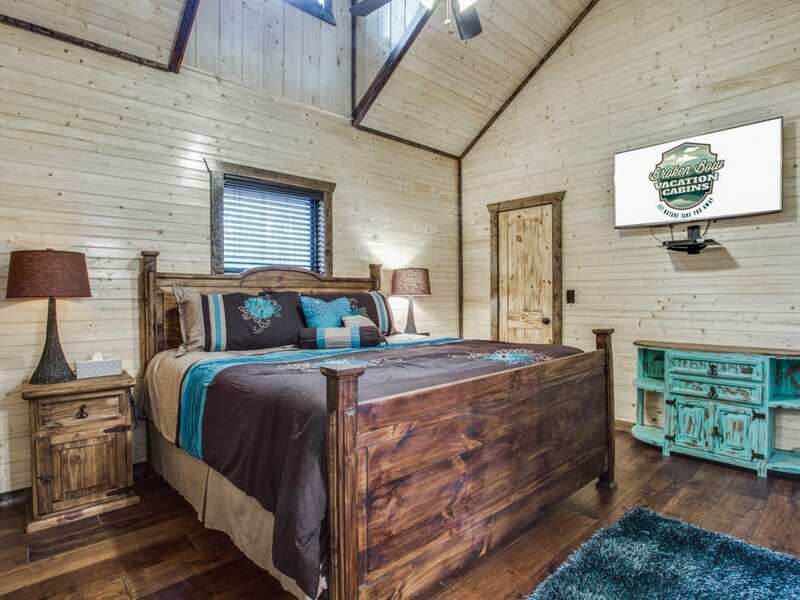 To the right of the living area bedroom number 1 has king size bed and 55” HDTV with Direct TV package. 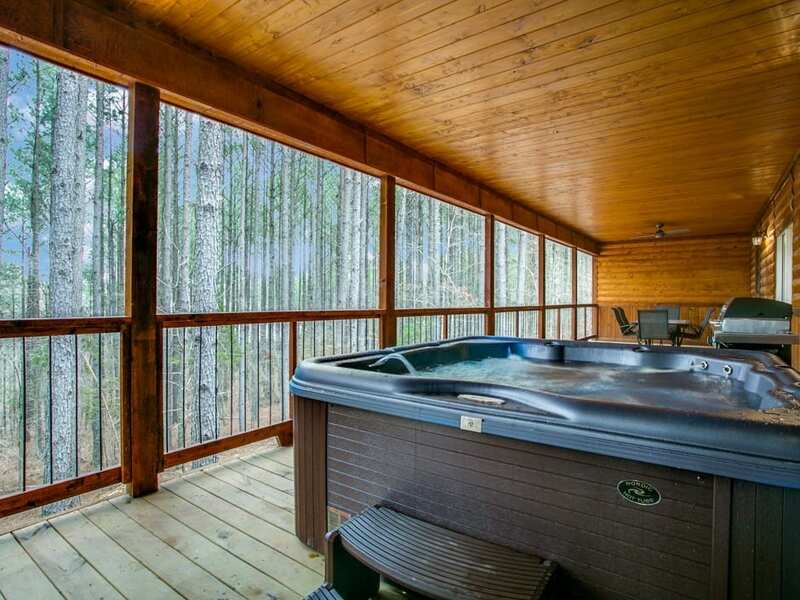 The attached bath has a walk-in tile shower, separate bathtub, double vanity and private toilet area. Across the hall is bedroom number 2 with a king size bed and 55” HDTV. 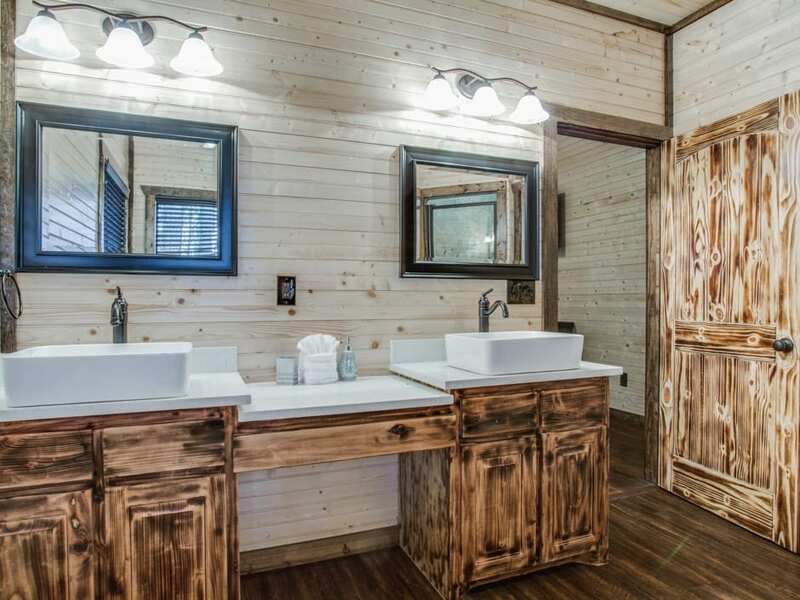 The attached bath has a shower stall and single vanity. 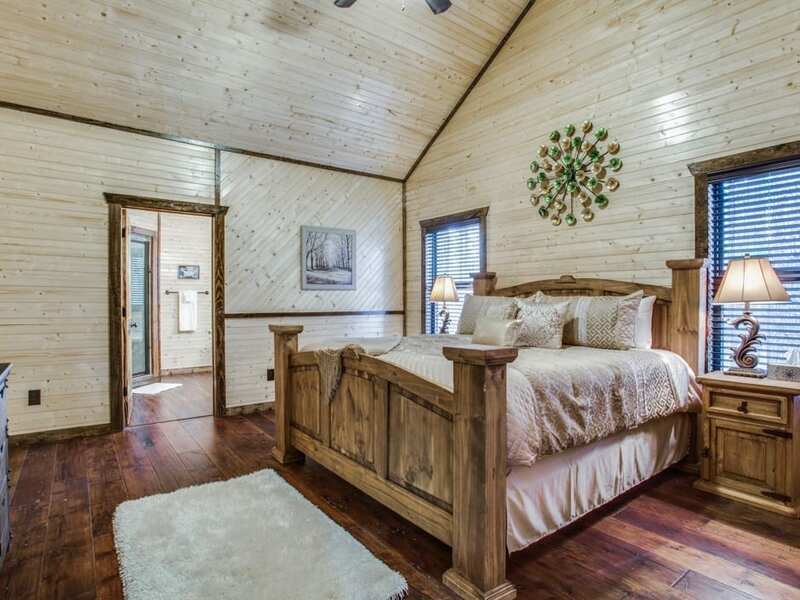 The feature of this bedroom is the private porch that over looks the front of the cabin. To the left of the kitchen find bedroom number 3 with king size bed and 55” HDTV. 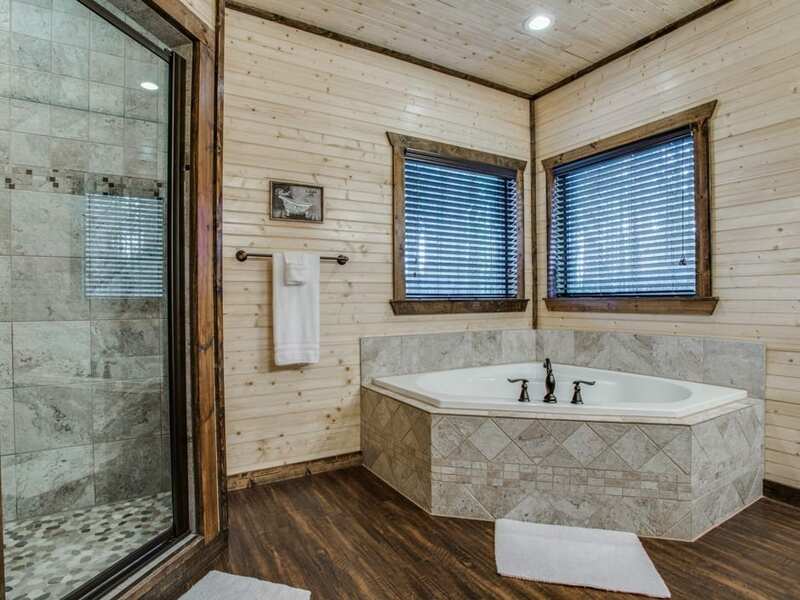 The attached bath has a shower/tub combo and a single vanity. Bedroom number 4 has a king size bed and 55” HDTV. 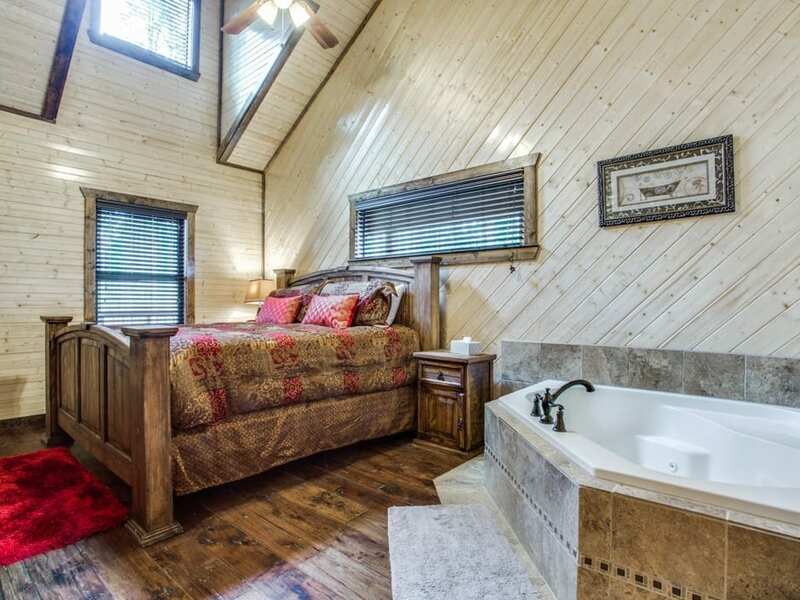 This bedroom is set up for romance with a corner jacuzzi tub in the bedroom area. 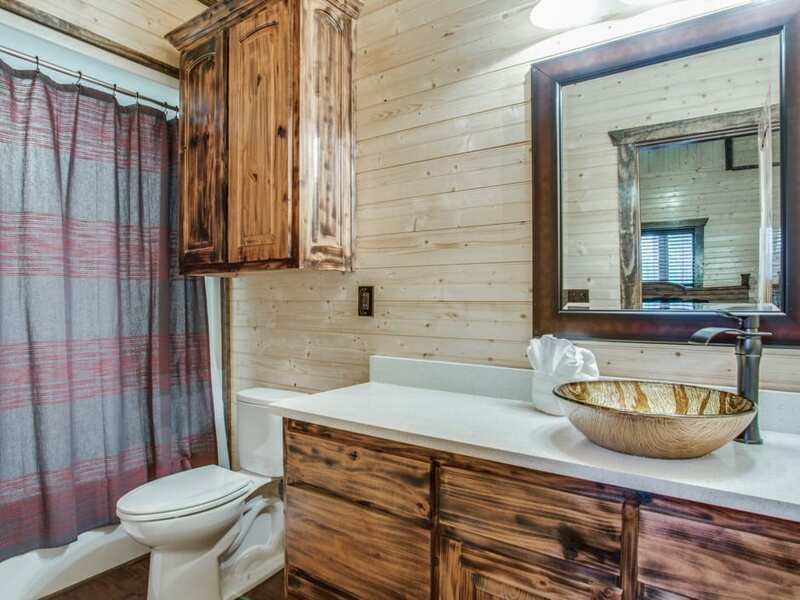 The attached bath has a private toilet, double vanities and a walk-in tiled shower. A spiral staircase takes you to the basement floor where you will find space to enjoy a game of billiards and other activities with family and friends. 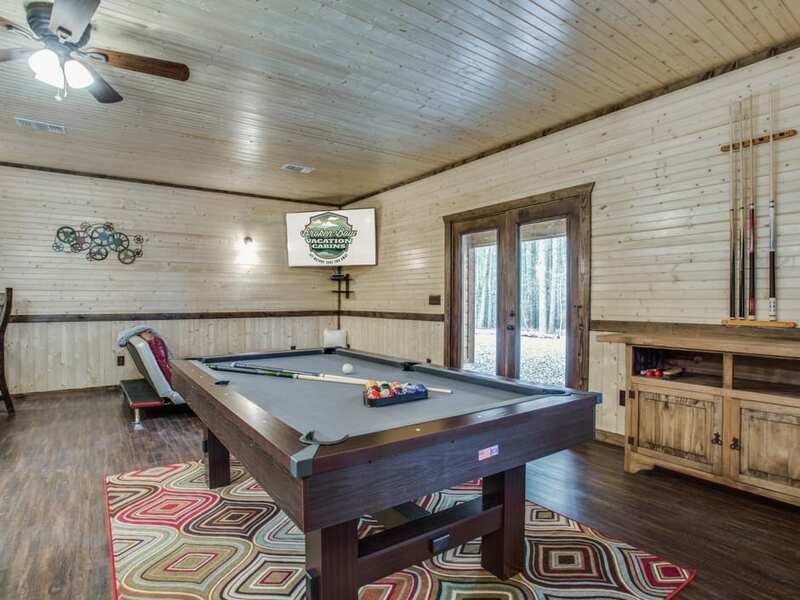 There is a 55” HDTV with Direct TV package, a click-clack sofa-sleeper, a bistro table and stools at the bar for gathering. 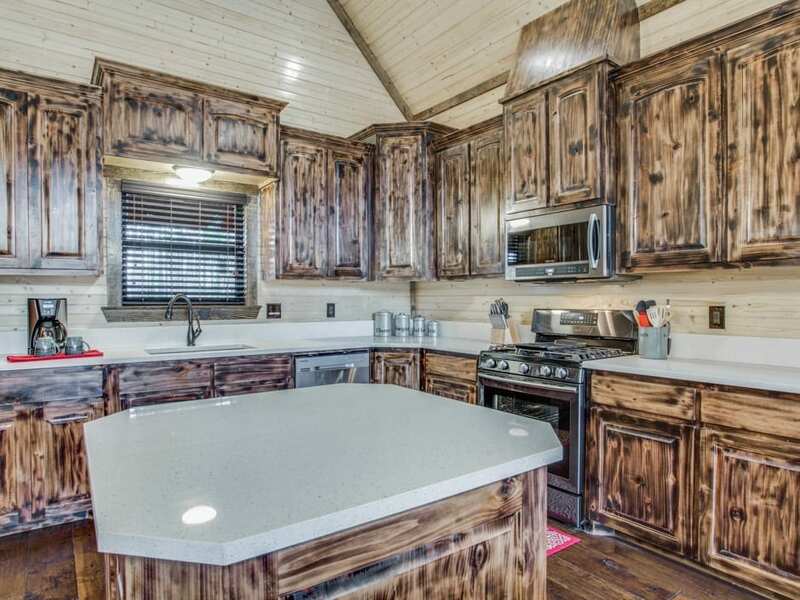 The area has a sink, mini refrigerator, microwave and ice-maker for convenience. 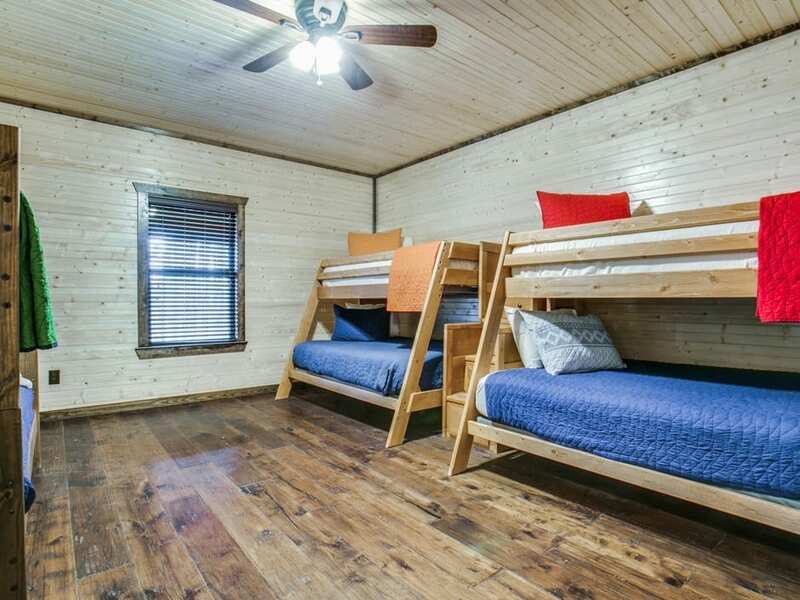 The downstairs bedroom is a bunk room with 2 full and 4 twin size beds. The bunk room has a 55” HDTV for separate viewing. 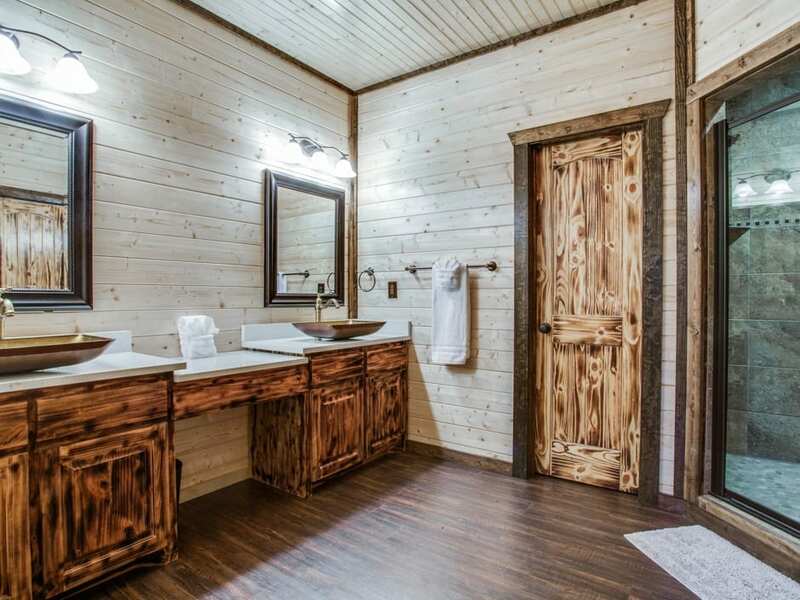 There is a full bath downstairs with tub/shower combo and single vanity. The deck area is accessed from the kitchen. 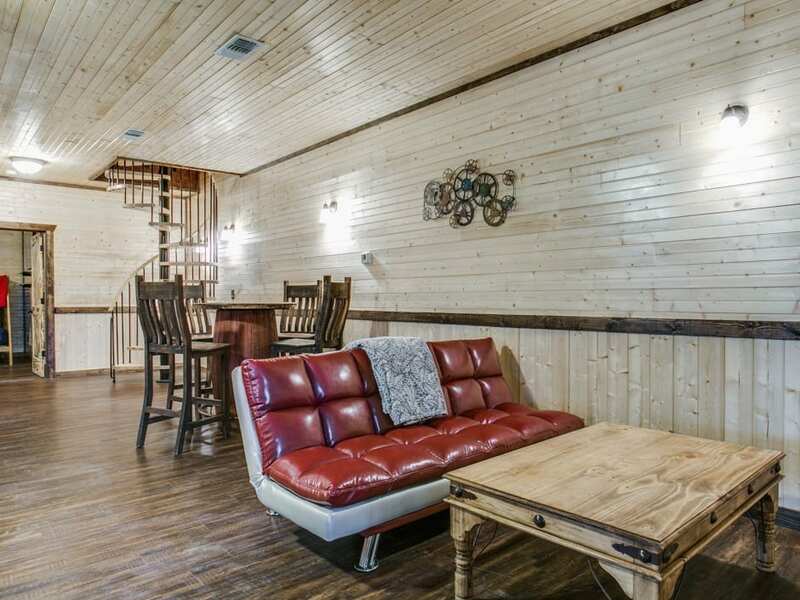 On the back deck you will find the gas grill (propane provided), a dining table with seating for 6, a corner gas burning fireplace with conversation seating, a HGTV with Direct TV package and a 6-person hot tub. 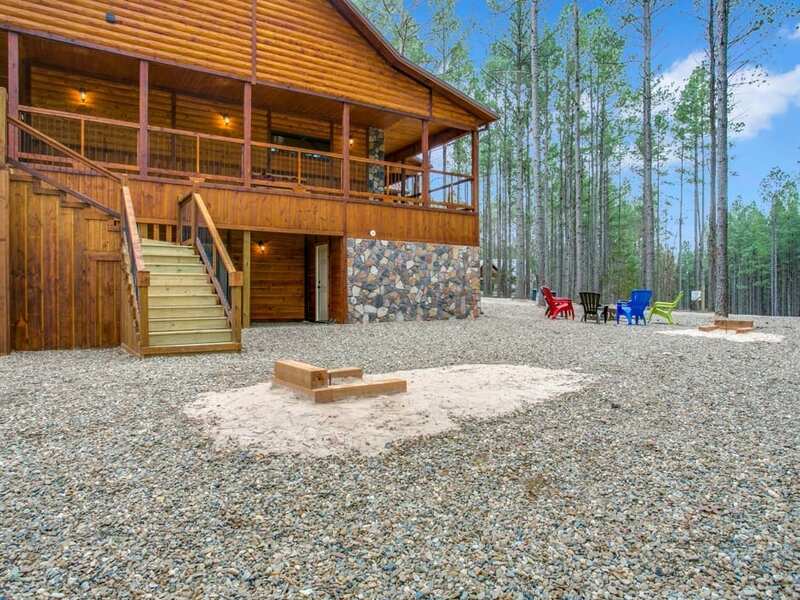 Enjoy a game of horse-shoes next to an open fire in the circle fire pit on the grounds to the side of the cabin. 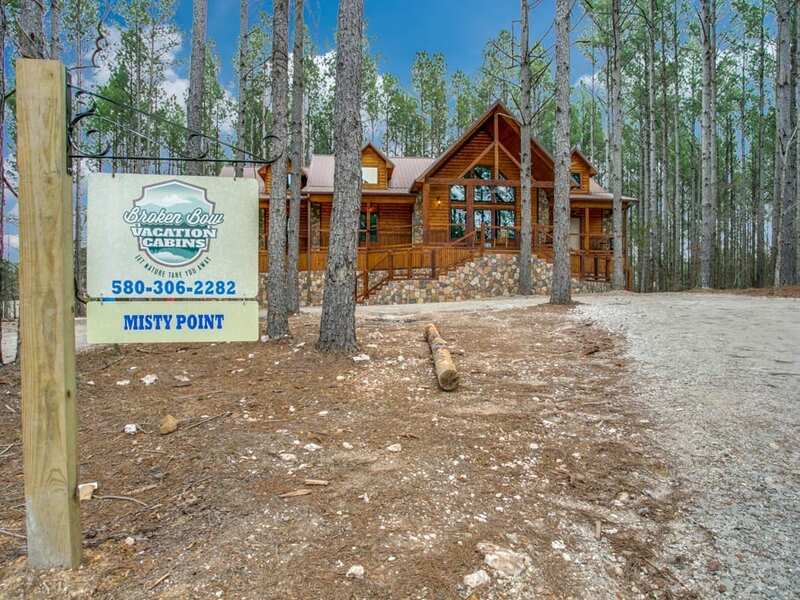 Purchase wood through our reservation system.